Reeves Financial is a qualified, registered Independent Financial Advisory Service (IFA), which has been operating for over 20 years to deliver impartial advice to clients across London, West Sussex, Kent and Surrey. The company focuses on client satisfaction by listening carefully to your financial goals and priorities to provide advice and guidance in clear, easy to follow language. They take a proactive approach in informing clients about relevant industry changes, communicating on a regular basis. The team at Reeves Financial offers a broad range of financial services to cater to clients at all stages of life, from investments and savings advice to assistance with pensions, retirement planning and equity release. They can also assist with business requirements, offering insurance advice, mortgage options and professional tax planning for private and commercial purposes. 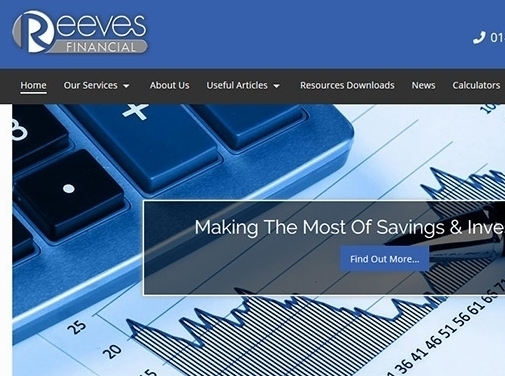 If you require financial assistance for any purpose, contact Reeves Financial for more information or visit their website today. UK (East Grinstead, West Sussex) based business - established over 20 years ago - providing independent financial advice. Website includes details fo services provided, testimonials, news section, terms and conditions, details of complaints procedure, full contact details including company registration number.